The villa, accessed via a private driveway, is surrounded by a large private garden with private swimming pool. The interior comprises: lounge, kitchen, dining area with 2 en-suite bedrooms and 1 guest bathroom on the ground floor with further 3-en-suite bedrooms plus panoramic terrace on the upper floor. Bedroom 4 has 2 single beds. En suite bathroom. Villa Biniparrell can sleep up to 9 people. The swimming pool of Villa Biniparrell is private and attracts sun all day. An oasis of privacy and seclusion surrounded by gardens and mature trees providing additional shade during the hottest hours of the day. As with all our properties, do not permit organised parties/events, loud music etc. 5* clean nice place good location big enough for ten with no problems, beds need change an extra pillows but if thatâ€™s the worst it canâ€™t be bad! the villa itself was fantastic.... suited our needs perfectly. Sorry, let me say it in german. Das Haus ist in jeder Hinsicht pefekt: sehr gute Ausstattung, gute KÃ¼chenutensilien viel Platz, auch wenn mal jemand in Ruhe ein Buch lesen mÃ¶chte perfekt fÃ¼r GroÃŸfamilien mit Kindern, gute Lage, ruhig, dennoch nicht weit zu StrÃ¤nen und EinkaufmÃ¶glichkeiten Schade, wenn das Haus verkauft wÃ¼rde, wir kÃ¤men gerne wieder die Betreuung durch agnitravel war sehr nett und es gab sehr detaillierte Angaben fÃ¼r alle EventualitÃ¤ten, die wir zum GlÃ¼ck nicht in Anspruch nehmen mussten. The house is perfect in every way: very good quality, good kitchen utensils a lot of space, even if someone wants to read a book in peace perfect for extended families with children, good location, quiet, yet not far to beaches and shopping Too bad, if the house would be sold, we would like to come back the support by agnitravel was very nice and there was very detailed information for all eventualities, which luckily we did not have to use. Sensational. 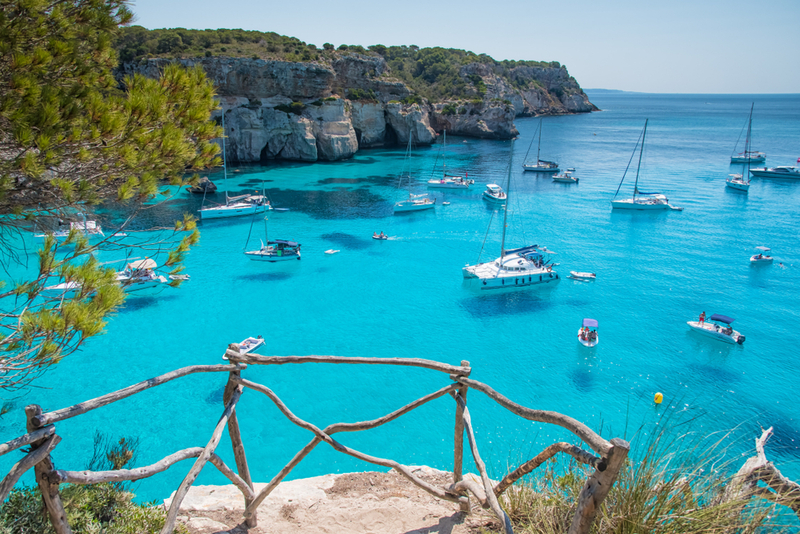 I love Menorca, and have visited several times a year for the last 5 years. This property was by far the best I have stayed in. I love the location, away from the thumping tourism that can overtake the island in the summer months. Just our own private oasis. A great place for friends and family with 5 bedrooms and 6 bathrooms and ample indoor/outdoor space for everyone. The idea of a small freezer next to the fridge was a great one. The bets are comfortable, however the bed sheets were a little "general use" for the price we were paying, but that would be the only criticism that I could possibly give this place for our 4 night stay. I will be back!! The villa was lovely. The space for the 9 of us was wonderful and the beds were the most comfortable we have slept on in a holiday house. Occasional noise from planes landing or taking off however given the property is so close to airport it was surprisingly peaceful. The outdoor eating space is perfect. Having the cricket club across the road provided some entertainment for some of our party and on arrival at lunchtime and before shopping - the lunch and bar at the cricket club proved very useful and tasty. 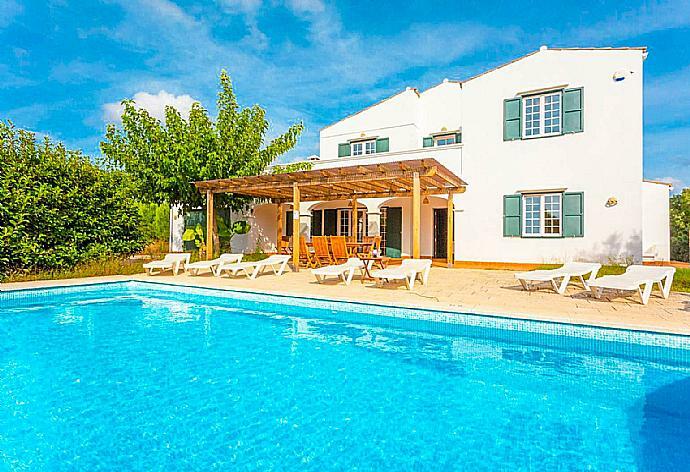 All in all a really good holiday villa with pool. Excellent communication with Agni Travel when booking. Very happy with all. We are a family group of 8 adults (including partners). We rocked up on Saturday 5th August 2017 for a week's stay, and loved the place straight away. Tortoises in the garden and a mule/donkey somewhere in a nearby field. Plenty of room. Everything you need on site. Cricket ground opposite. Narrow roads near the villa, lined with dry-stone walls - takes a wee while to get used to when driving. Near the airport (not noisy) and 10 minute drive to the nearest beach. Lovely villa and pool vaste garden area with tortoises roaming free much to the delight of our grand children. We definately needed a car but the beaches were within easy reaching distance just a short drive away. Sant Lluis is a lovely town with plenty of shops and bars. Great property. Very good and quick service when we had a problem with the electricity cutting out. Very well equipped. Would have no hesitation in returning to stay in this villa were I to return to Menorca. Beautiful island with lots to do and to see. The house was perfect, quiet spacious very clean well equipped and comfortable. And very near the airport and some supermarkets too. The villa was excellent and although there were 9 of us we didn't feel on top of each other. We would definitely recommend it to others. The villa is very well equipped and full of charm. Ideally situated on the edge of BiniParrell and only a short drive to numerous top quality beaches; the location is excellent. Situated in a quiet and secluded location and surrounded by mature trees; it is both peaceful and private allowing you to enjoy the outdoor space to the full. The up front information and ease of booking surpasses anything that we have comes across before and the rental cost is very competitive. All in all a really good choice!. Sant Lluis is a historic town, founded by the French and built around a large Church. Enjoy the local winery, excellent restaurants and even the traditional horse 'trotting' races! Villa Biniparrell was booked 3 days ago!